Before you begin this tutorial...let me include a disclaimer: This is NOT my best work. It could have been...I tried to have it be...but the choice of threads used...almost ruined it. Or, the choice of transfer methods...which every way you look at it. Surface embroidery is enhanced with a dimensional leaf to portray the leaves and acorns. The squirrels and chipmunks are sure happy to see these begin to drop from the mighty oak’s branches. · Embroidery Thread in brown, gold, orange, and red/orange for the surface embroidery leaf. NOTE: The model was stitched in Kreinik Soie d’Alger in colors #4213G, #2546G, #4116A, and #645A. However, these were proven not to be color fast as they bled when the finished project was placed in water to remove the water soluble stabilizer. Therefore, if you use these threads, trace the pattern or use a tissue paper pattern instead of water soluble. 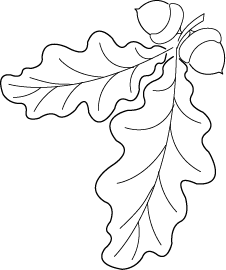 · Cotton or silk sewing or embroidery thread in white for the Stumpwork Oak Leaf. · Promarkers (or permanent ink marker) in a dark red, orange, and yellow. The surface embroidery work is best done in two threads, often combining two colors. Here are the combinations used for the model: acorns and center vein = gold/brown (#2546/#4213); acorn cap = dk brown/dk brown (#4116A); leaf inside = gold/orange (#2546G/645A). Step 1: Hoop the background fabric, with the small leaf and acorn pattern transferred for stitching. Here is the design printed on the stabilizer, and trimmed close (to reduce the amount that needs to be removed later on). You can see that this water soluble creates a good printed image. The paper backing peels off and the design has a "sticky back" that stays on the fabric as you stitch over it. Step 2: Use a tiny Chain Stitch or Reverse Chain Stitch to embroider the outline of the oak leaf; a Satin Stitch to embroider the base of the acorn caps; and a Split Stitch to embroider the leaf veins. I'm not sure that the mixed thread colors was the best choice for the acorn it looks a bit rougher than it is. Step 3: Fill in the acorn cap with French or Colonial Knots. Step 4: Embroider the inside area of the leaf with Split Stitches. Be careful to align these stitches with the direction of the adjacent side-veins. Work one section between these veins completely before proceeding to the next. Note that the direction of the stitching will change slightly as you progress up the leaf. Step 6: Hoop the layers of organza and the silk scarf. The scarf is on top. The silk provides a solid tightly woven layer to ink color into later on. The organza layers provide more substance to the piece but do not increase the density of the piece because their weave is more open than the silk is. The design should be already transferred to the silk fabric. The water soluble stitch stabilizer works really well for this pattern transfer. Step 7: Cut ten-inches of wire. Bend one end at a 90-degree angle, about a half inch from the end. Using the white thread, couch this bend into the stem end of the leaf. Sew through all layers as you couch the thread down. Try to keep your needle angled slightly under the wire as you stitch, this will keep the couching stitch tight to the wire. Make a stitch about every 5mm (or about every ¼ inch). As you work around the leaf shape, couching the wire in place…use a second larger needle (like a Chenille) or a stiletto tool to “shape” the wire. Step 8: Continue to Couch and bend the wire. At times, this requires a slight forward step with the Bending Tool, gently bending and them more forward movement with the tool; and gently bending some more. This works better than trying to get the shape with a single bend…that will only give you a sharp angle. The goal is to match the curve to the leaf pattern shape. Step 9: After the wire has been completely couched in place, trim the stem ends to about 1//2 inch. Use the same white thread to create a tiny Buttonhole Stitch around the wire. This secures the fabric tightly into place. Working with thread will take a little time; but do not use two pieces thinking it will be better or faster. It will just give the leaf a bulky edge and ruin your efforts. The “ridge” of the Buttonhole Stitch should lay on the INSIDE of the leave design…not along the outside for this specific pattern. This gives the edge a smoother line rather than a ridged one. Step 10: Using one strand of the white, embroidery the leaf veins with a tiny Chain Stitch or Reverse Chain Stitch. Step 11: Cut the leaf from the background fabric leaving some border around the wire. Step 12: Trim close to the wire to remove all of the excess fabric. A pair of sharp pointed embroidery scissors make a great tool for this task. Step 13: Use the red Promarker to ink the outside stitched edge of the leaf. The ink will automatically wick to the inside area of the leaf a bit. Just touch the stitching along the outside edge. NOTE: If you do not want to use the Promarkers...you can use a Green/Orange color of sheer fabric and thread instead; and omit Steps 13 and 14 then. Step 14: Use the yellow Promarker for the inside of the leaf and the orange Promarker to color the veins. These colors will begin to blend together. If you have used a water-soluble method to mark the leaf shape, then soak the leaf to remove these marking. The ink will run some, but it will only enhance the blending effect. Dry completely. Step 15: Tightly twist the two ends of the leaf’s wire at the stem edge. With a large needle or stiletto pierce the background fabric at the “circle” on the pattern sheet. Bend the leaf wire at a 90-degree angle and insert the twisted double wire into the background fabric. Flip over the work, and couch the wire ends down on the back. Sew through the prior embroidery work only, and do not pierce the fabric. 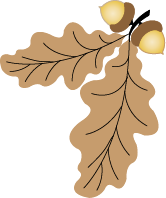 Here is the pattern for the small leaf and acorns, for the surface embroidery technique. Here is the pattern for the large leaf, for the stumpwork technique. And, here is the pattern all together, just in case you want to do the entire design using surface embroidery techniques. You can size these as large or as small as you like. I'm off to take out the satin stitches and redo...when I get a new photo...I'll post an update to this post. Thanks for this great tutorial! I have wanted to try stump work for a long time and your instructions are always so clear that it might spur me on to give it a try! It is always comforting to see the humanness of people so sharing a piece you feel isn't perfect does that although it looks great to me. This is a fabulous post. I think it's just as important to show difficulties and mistakes as it is to show a perfect project. I am so new to this craft. It's important to figure out how to fix things. Thanks for your generosity in sharing so much. I can't wait to take your classes.